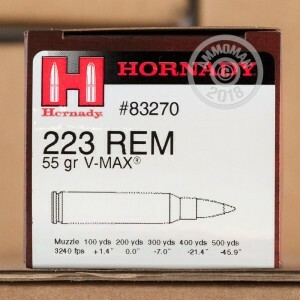 Next time you go out for peccary, gophers, coyote, and other small/medium sized game, load up with these excellent V-MAX hunting rounds from Hornady. They are ideal for your .223 or 5.56mm chambered AR platforms as well as your bolt-action and single shot breech-loaded rifles. 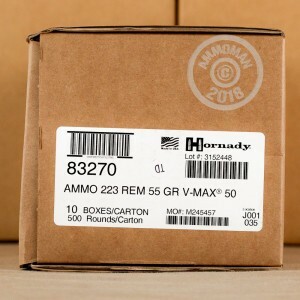 Hornady is an American ammunition company known for their research in optimizing terminal ballistics. Alongside their finished ammunition, many other companies create some of the most effective self-defense and hunting cartridges using Hornady's premium selection of bullets. The VMAX bullet design consists of a hollow-point projectile with a polymer tip insert which serves to improve aerodynamics while also initiating fragmentation on impact with the target. There is a small cavity beneath the base of the polymer tip which causes it to build up energy right before it is hit by the lead core behind it; this makes fragmentation and wound cavities even more devastating. 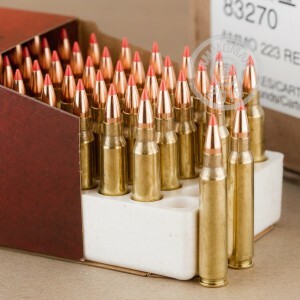 With a weight of 55 grains, these rounds fit the ballistics of very common range ammo in this caliber and thus require minimal sight and optic adjustment. These rounds leave the muzzle of a 24 inch barrel at 3,240 feet per second while carrying 1,282 foot-pounds of energy. The bullets have a very flat trajectory and will rise 1.4 inches at 100 yards and fall back to a neutral point of impact at 200 yards where they will still possess 763 foot-pounds of energy.